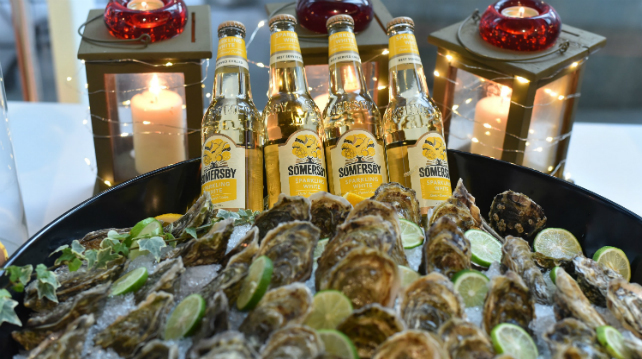 Joining the ranks of the elegant pink Sparkling Rosé, Somersby’s latest Sparkling White combines the best of sparkling wine and cider. Plus, we have the honour of being the first Asian country outside of Europe to launch Sparkling White cider. The light, fruity aromas of white wine with a semi-sweet cider makes a sophisticated personality that’s light and easy to drink – perfect for long hot days like ours in Malaysia. Sparkling White is easy on the palate, less sweet and without any acidity, and a good alternative to wine and champagne at 4.5% ABV (so you can enjoy more without getting too woozy) and at a more affordable price point. It pairs exceptionally well with seafood, white meat, and ham and cheese, and we’d drink it over an easy afternoon by the pool or together with an oyster brunch. To appreciate it at its best, serve chilled (without ice) in a wine glass for the full experience. Sparkling White is available as a 330ml bottle and in a four-bottle pack, and can be found in any major supermarkets, hypermarkets, and selected convenience stores across the country. For more information, check out their website.